School of Fish: New uniforms! While we were in Florida on furlough, we had the opportunity to speak at my brother's church. The congregation there was very friendly and supportive. 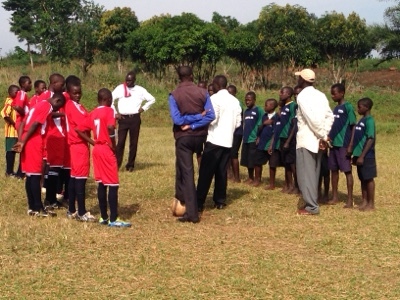 Many members of that church thought of different ways of supporting our work here in Uganda. One woman had access to many team sets of unused uniform jerseys. She offered to send them back with us. Today many of those uniforms were able to be used! The primary school here at Good Shepherd's Fold goes up through P7, similar to the 7th grade in the U.S. This term of their school year includes team sports. Uniforms are something every team would love to have, but not many can afford. 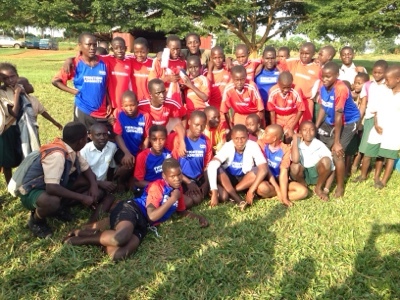 Today the GSF primary school was able to provide jerseys for the visiting team, sending them home with a team set! Here is a photo I took as they were preparing to play. The GSF team is in the red on the left. 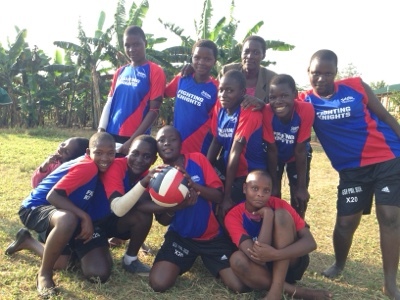 The girls' netball team was also able to use another set of jerseys. Netball is a common sport here, similar to basketball, but played on a grass field with no dribbling. The girls were all asking for their photo to be taken in their new uniforms. Yes, teenage girls everywhere like to have their picture taken. I enjoyed being able to see how excited the players were to have these new uniforms. We are very grateful for the thoughtfulness of this one woman to give what she had. It makes me wonder what a blessing it would be if each of us were to take the time to consider what gifts, talents, or material possessions we might have that could be used in the lives of others for God's glory. These uniforms were not being used by anyone else, just sitting in a warehouse. Instead of being wasted, they were set apart to bless many children in rural villages of Uganda, Africa in the name of Jesus. What gifts or material possessions do I have that God might be calling me to use somewhere, somehow to help others know more about him? What about you? This is great Lisa. Advent will be so excited to see these being used! Great story, the teams look great in those uniforms.